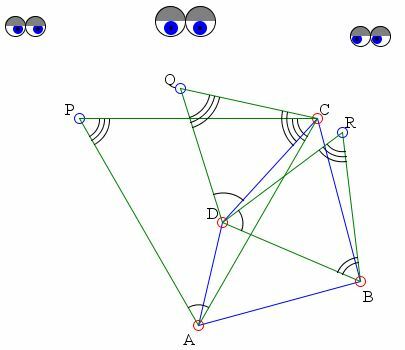 Given any quadrilateral ABCD, if similar triangles ACP, DCQ, and DBR are constructed on AC, DC, and DB, away from AB so that ∠APC = ∠ASB, where S is the intersection of AD and BC extended, then P, Q, R, S are collinear. The constructed triangles are similar and not necessarily equilateral. ∠ECB = 180° - ∠A - ∠B = ∠APC. ∠PCA + ∠PCD = ∠QCD + ∠PCD. and so ∠ACB = ∠APQ. 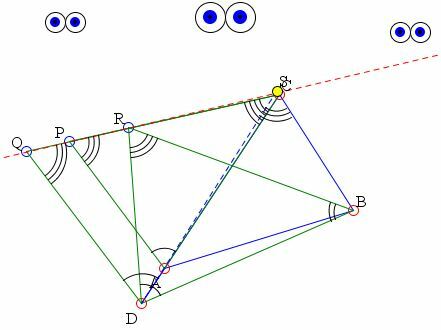 By constructing DG parallel and equal to CB, we can prove in a similar manner that ∠ADB = ∠QRB. A counterclockwise rotation of size ∠PAC around A carries C to a point C' on the line through AP, and B to B'. But, since ∠ACB = ∠APQ, we have ∠AC'B' = ∠APQ and, therefore, C'B' is parallel to PQ. Thus PQ is inclined to BC at an angle of size ∠PAC. Similarly, from a clockwise rotation around B through ∠DBR that takes A to A' and D to D', we have A'D' is parallel to QR, that is, QR is inclined to AD at an angle of -∠DBR. rotating BC through ∠PAC and AD through -∠DBR (in appropriate direction), aligns B'C' and A'D' in the same direction, and we therefore have that PQ and QR also line up in the same direction, i.e., P, Q, and R are collinear. Next construct ∠QS1D = ∠QCD with S1 on QR. Connect S1 with C. We now prove that ∠DS1C = 180° - ∠A - ∠B and that S1CD and S1DA are straight lines, hence S1 and S coincide. From the construction we have QDCS1 is a cyclic quadrilateral. Thus ∠DS1C = ∠DQC = 180°. Also, ∠S1CD = ∠PQD. ∠PQD = 180° - ∠CPQ - ∠QCP -∠DQC = ∠S1CD. and ∠DCA = ∠QCP, ∠ACE = ∠CPQ and ∠ECB = ∠DQC.